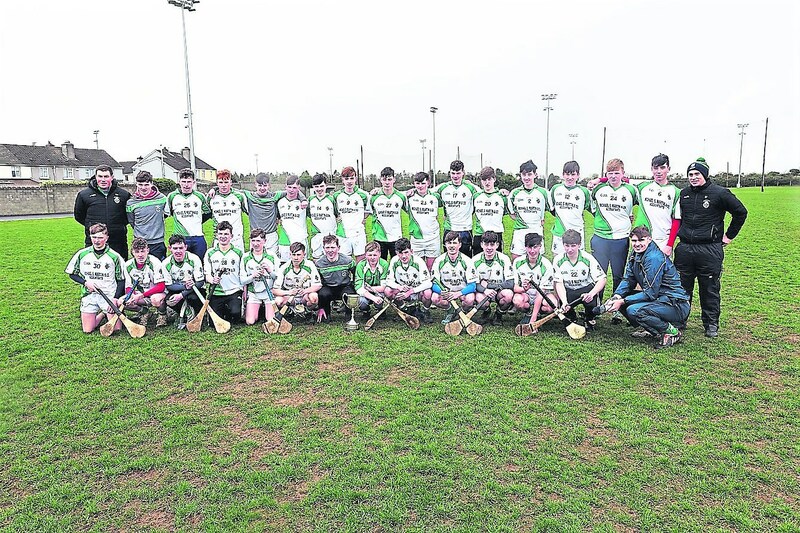 The Abbey CBS, Tipperary, defeated Coláiste Phobail Roscrea to claim the Corn Uí Laoghaire Tipperary Post Primary Hurling trophy. In a hard-fought contest played in Dr Morris Park the Tipperary town boys came out on top to win their first U17H B title, on a scoreline 1-13 to 1-8. Strong winds sleet and rain showers made playing conditions difficult, but it did not detract from the game as a contest. The Abbey aided by a strong breeze in the first half stormed into an early lead with three early frees from Robbie Byron and points from play from Eoghan Lonergan and Byron. Roscrea responded with points from Dylan Hogan and Conor Donovan. The Abbey led by five points to two mid-way through the first half before Eoghan Lonergan finished a ball to the net from a long range free that dropped short. This score seemed to ignite Roscrea into action who went on to score five unanswered points from play by Luke Seacy, Paul Cleary, Kenny Lee and two fine points from Conor Donovan who was excellent throughout. Byron added a free for the Abbey to leave the half time score 1-6 to 0-7 in favour of the Abbey School. Roscrea would play with the breeze to their backs in the second period, but it was the Abbey who started the half the stronger. Byron picking up where he left off with two early frees to stretch the lead to four points. Roscrea will rue the amount of chances they let go to waste especially in the second half. With a total of seventeen wides in the game, if their shooting boots had been on, it could have been a different result. It was ten minutes before they registered their first score which was a goal by Dylan Hogan who capitalised on some poor defending from the Abbey. However, Roscrea failed to get level with the Abbey due to some heroic defending by Eoin Marnane, David Harold Barry and Mikie O Brien. The Abbey pushed on with points from Paudie Bradshaw and Evan Hawkings who had just been introduced from the bench. It was all set for a close finish when Donovan scored from midfield for Roscrea, it looked like they might finish the stronger, but the Abbey men dug deep and points from Byron and Lonergan sealed the victory. Abbey School: Adam Dunne (captain, Arravale Rovers), Brian Marnane (Golden/Kilfeacle), David Harold-Barry (Galtee Rovers), Shane Maher (Arravale Rovers), Raymond Kelly (Arravale Rovers), Eoin Marnane (Golden/Kilfeacle), Mikie O’Brien (Cappawhite), Diarmuid Looby (Lattin Gaels), Jack O’Halloran (Lattin Gaels), Paudie Bradshaw (0-1) (Eire Óg Anacarthy/Donohill), Michael Lowry (Arravale Rovers), Eoghan Lonergan (1-2, Arravale Rovers), Robbie Byron (0-9,0-7f) (Galtee Rovers), Niall Sharpe (Arravale Rovers), Tony O’Neill (Lattin-Cullen). The Abbey School Panel, County Post Primary Schools U-17 Hurling 'B' winners, after defeating Coláiste Phobail, Roscrea in the final in Dr. Morris Park, Thurles, on Tuesday week last. Subs: Evan Hawkins (0-1)(Arravale Rovers), Eamonn Ryan (Arravale Rovers), Donagh Hickey (Arravale Rovers), Darragh Kennedy (Galtee Rovers), Andrew Richardson (Arravale Rovers), Jack English (Arravale Rovers), Ben Carey (Aherlow Gaels), Darragh O’Brien (Eire Óg Anacarthy), Daniel O’Dwyer (Aherlow Gaels), Orrin Jones (Kickhams), Eoin Murray (Cappawhite), Darren Kennedy (Arravale Rovers), Ailbe Ryan (Kickhams), Liam Hayes (Kickhams), Aidan Duggan (Kickhams), Kaleb Molloy Hickey (Arravale Rovers). Management: Kieran Hickey (Garryspillane), Dinny Ferncombe (Holycross-Ballycahill) and Josh Ryan (Doon). Coláiste Phobail Roscrea: James Treacy (Roscrea), Nathan Carroll (Shinrone), JJ O Brien (Roscrea), Patrick Sheeran (Moneygall), Lee Doran (Roscrea), Conor Dooley (Shinrone), Conor Shanahan (Roscrea), Luke Watkins (Shinrone), Conor Donovan (Roscrea), Kenny Lee (0-1)(Roscrea), Luke Seacy (0-1)(Roscrea), Dylan Hogan (1-1) (Shinrone), John Donovan (0-4, 0-3f) (Roscrea), Adam Nash (Shinrone), Paul Cleary (0-1) (Roscrea). Subs: Joe Larkin, Shane Whyte, Liam Murphy, Sean Dooley, Sean Delaney, Enda Moore, Shane Feehan, Diarmuid McLoughlin, Mark Fogarty, Jamie Ryan, Darren Doyle, Brian Bergin, Óisín Moloney, Adam Delaney.